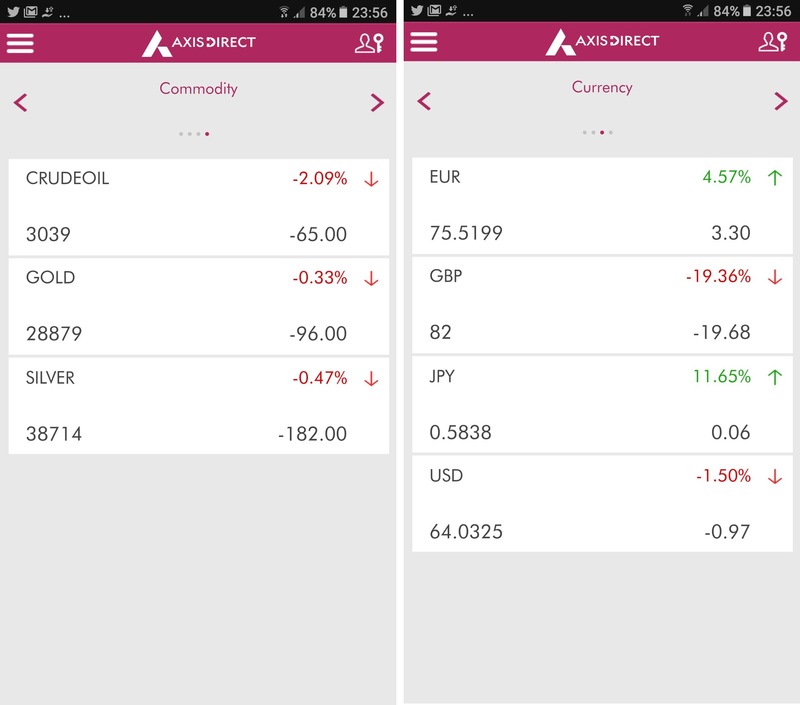 AxisDirect Mobile app is one of those apps that show a wide variety in what they have to offer in terms of the number of features, analysis depth and what not, But falters a bit when it comes to smaller issues! This implies that this mobile trading app has a lot to offer, but it seems there are some bugs/issues in the app that make the overall trading experience a bit mediocre. Either the product team is in hurray of the launch or the broker has an average testing team. Nonetheless, there are some areas where AxisDirect Mobile app certainly needs to work upon to become one of the best mobile trading apps for its clients. Let’s understand the mobile app closely. Axis Direct, as we know, is one of the prominent bank-based stockbrokers in India. However, the trading platform is one aspect where this full-service stockbroker needs some improvement in terms of maturity, performance and user experience. Nonetheless, in this detailed review, we will talk about the different aspects of the AxisDirect Mobile app with an emphasis on its features, configurations, merits, and demerits. One of the unique features of the mobile app is that it can run based on voice-based commands. More details on this in the features section below. This mobile app from AxisDirect is available for Android and iOS users for free. You are just required to browse the corresponding app store from your mobile, download and install the mobile app. 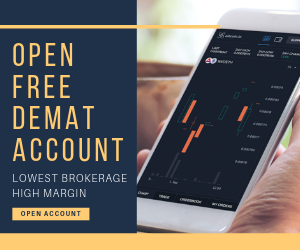 Once you do that, you can browse some of the default guest login based features, while if you are a client of the broker, you can access all the features provides in this app. 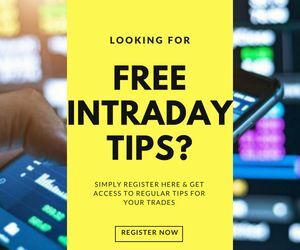 Hopefully, with this analysis, you will have a clear idea of whether you should be going ahead with this mobile app for your day to day trading. 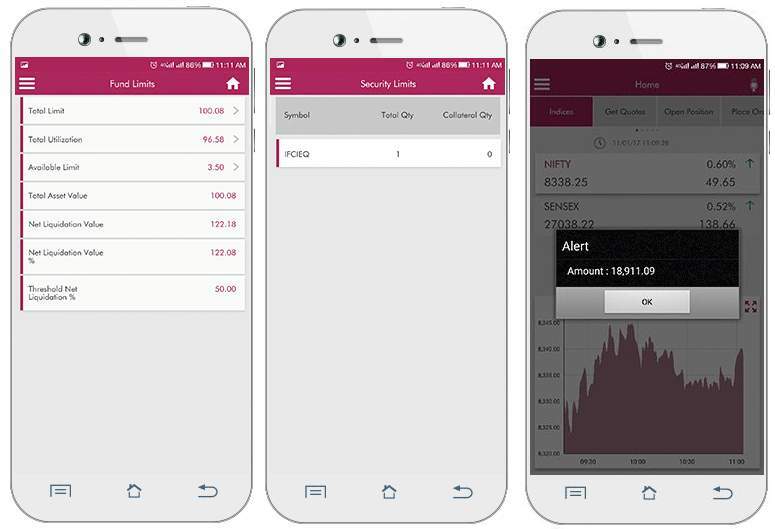 Once you login to the application, you are provided with the following features including access to domestic and international markets, segments such as Equity, commodity, currency along with the market watch, charting etc. 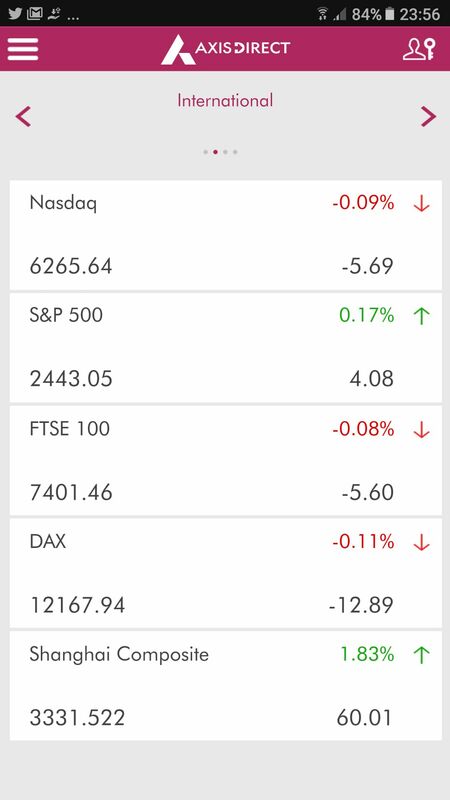 The below screenshot displays the information of different indices at that specific point in time. There have been few concerns raised about the delay of these feeds. You are advised to perform your own check before trusting the information and investing. 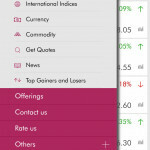 Users looking to monitor international stocks can do so using this mobile app. You can’t customize these feed entities though. On similar lines, you can access and view data across commodity and currency segments with the corresponding movements. 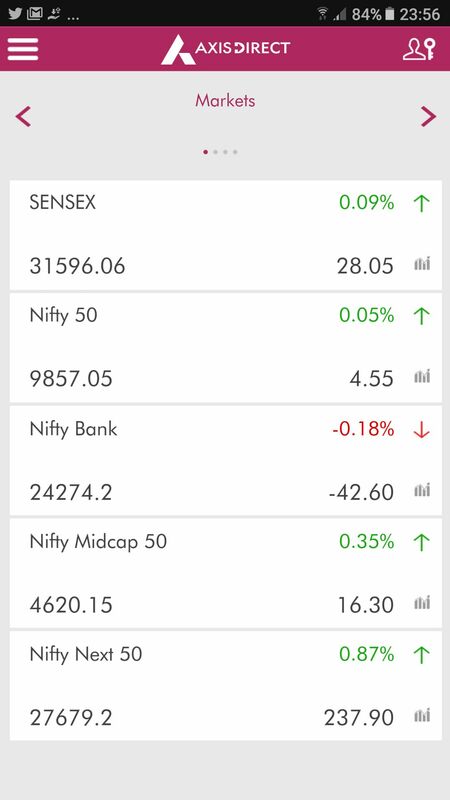 For intraday traders, there is a quick way to check out the top 5 gainers and losers of the day (or till that point of time in the day) with information on their last traded price and the corresponding percentage growth or drop in the stock value. At the same time, you can view some of the basic details of the stock with information on stock open, high, low, last traded price etc for an initial understanding of the company performance in the recent past. You can also use the charting functionality to perform fundamental and/or technical analysis. However, the charting flows provided are pretty basic in nature with limited improvisations. 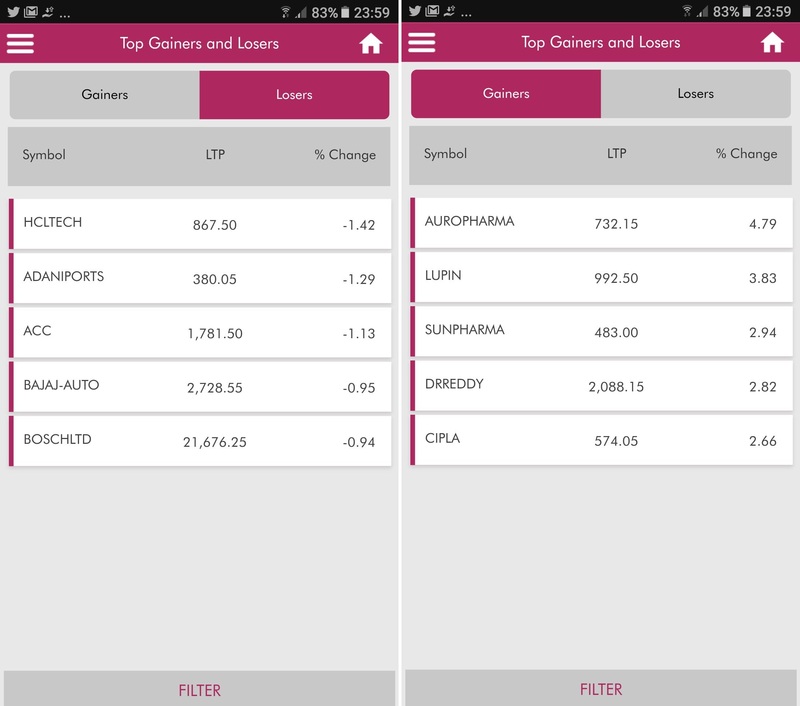 If you want to have a look at your portfolio and asset distribution, you can access the ‘My Portfolio’ section of the mobile app. 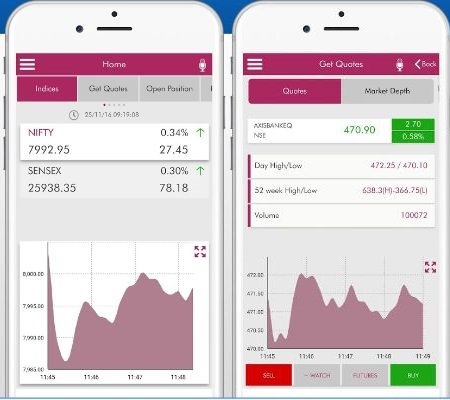 The app also provides you with some basic features such as Market Watchlists, using which you can add specific stocks and financial entities you want to monitor. Then there are features that help you to see Fund Limits, Bank Balance and Security Limits. All these information pieces can be seen individually with the help of a single tap on the menu and the corresponding screens will be displayed. Then comes, THE most important aspect of a mobile trading app – Order placement feature. You can do so by pressing the mic button and speaking out the exact stock/scrip along with the price and quantity. For instance, if you want to buy 100 stocks of SBI at ₹1200, then you need to speak out “Buy SBI 100 Quantity at ₹1200″. You are allowed to choose the preferred order type from various options such as Market Order, Limit Order, Stop Loss Order etc. 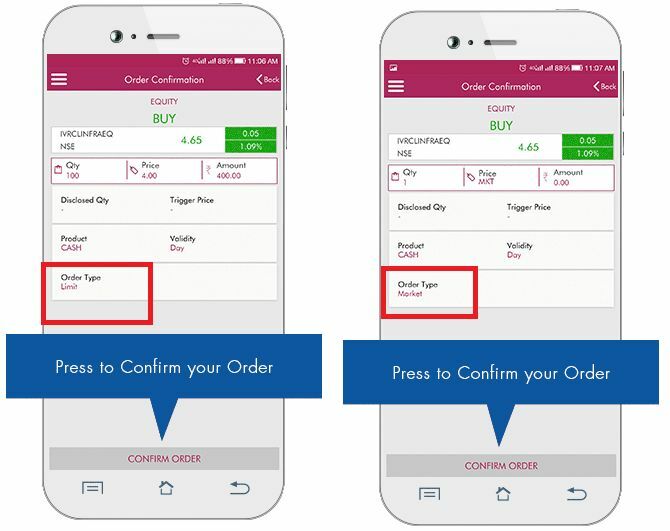 The app will ask you to confirm the order and order type before it executes. This is how your “Order Book” looks like, displaying all the information about your buys and sells through Axis Direct with the corresponding status of the order. 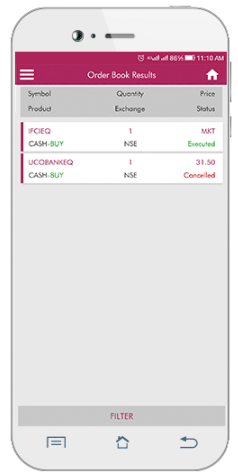 You can also view your fund limits within this mobile app including total limit available, utilization, available limit and so on. Finally, you can check out your account balance with Axis direct post your trades and orders. 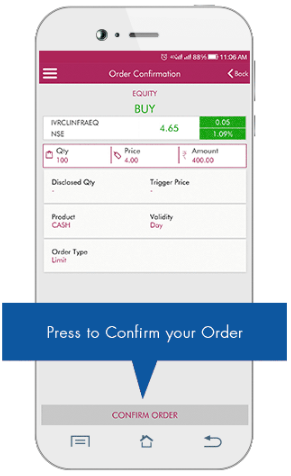 You can trade and invest across segments including Equity, Currency, Mutual funds, Derivatives using the mobile app. Multiple market watch lists allowed to be added. Guest login with minimal basic features allowed to be used without opening an account with Axis Direct. Order placement after market hours is allowed. 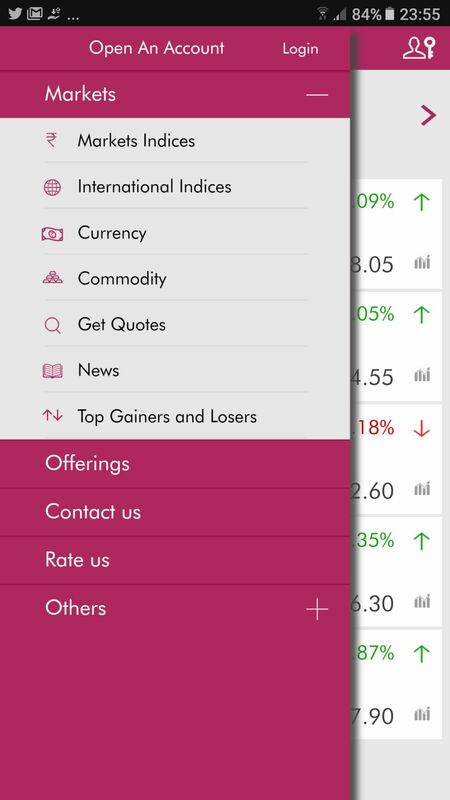 Since Axis Direct is a full-service stockbroker, you are provided with tips, research reports and recommendations within this mobile app for technical and fundamental analysis. The data feed can be slightly delayed at times. 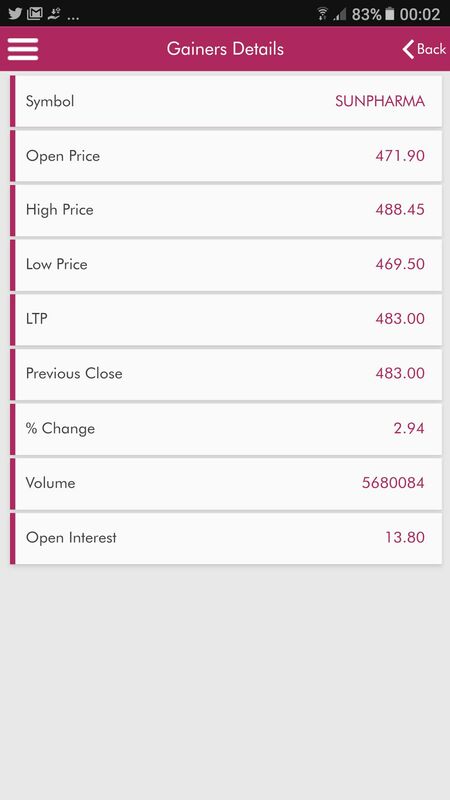 You cannot invest in IPOs or commodity segments using this AxisDirect mobile app. The AxisDirect mobile app is not supported on Windows and Blackberry platforms. Limited charting functionality with low usability for analysis. Before we wrap up this review on AxisDirect Mobile App, this needs to be understood that the app has no issues or complaints as far as the number of features it has to offer. It is pretty exhaustive from that perspective. Thus, users looking for a mobile trading app that has a wide range of features can easily look forward to this mobile app. However, you may need to compromise a bit on some of the issues that can make your trading experience a bit compromised. These issues can be around login, loading of any specific screen, automatic price refresh not happening etc but are not that frequent either. 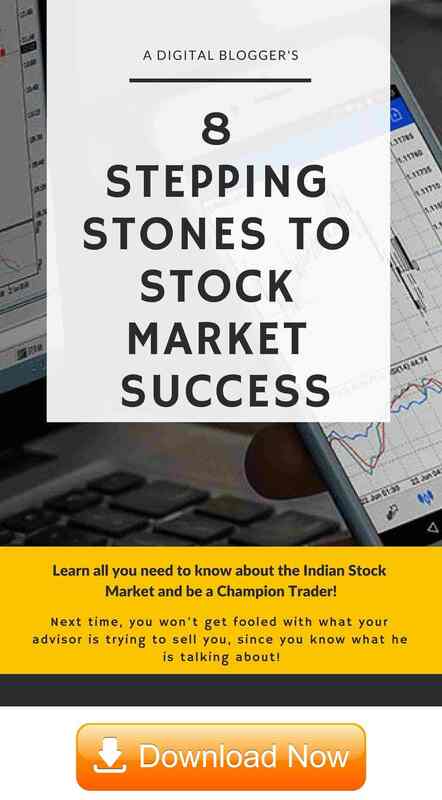 Are you looking to Open Demat and Trading Account?